Here’s One Thing That Can Really Attract BedbugsProtect yourself. If You Learn What a Bedbug Looks Like, You Won’t Freak Out Over False AlarmsMost people can’t pick a bedbug out of a lineup, leading to a lot of unnecessary angst when they spot another type of bug. The Long, Gross History of Using Bedbugs As MedicineA few centuries ago, they were used as medicine for pretty much everything. Bedbugs Allegedly Hanging Out at Brooklyn College On the Flatbush campus. It’s Time for Your End-of-Summer Bedbug UpdateThey’re still all over the subway. Bedbugs Are Now Causing Delays on the SubwayWe knew we couldn’t get rid of them that easily. There Might Be More Bedbugs on the SubwayHope you’re not going to the Mets game tonight. Why Just Reading About Bedbugs Is Making You All ItchyIt’s a contagious behavior, a neuroscientist explains. NYC Department of Health Has BedbugsEw. Bedbugs Would Prefer It If You Would Lay Off the SauceThey’re really not into boozy blood. What’s Worse Than Getting Arrested?Lockup + bedbugs. Bedbugs Are Getting Used to a Certain Kind of LifestyleThere’s an infestation at the Ritz. That Bedbug-Sniffing Dog Might Be Ripping You OffHe or she might be sniffing out a false positive. Is there no one you can trust?? 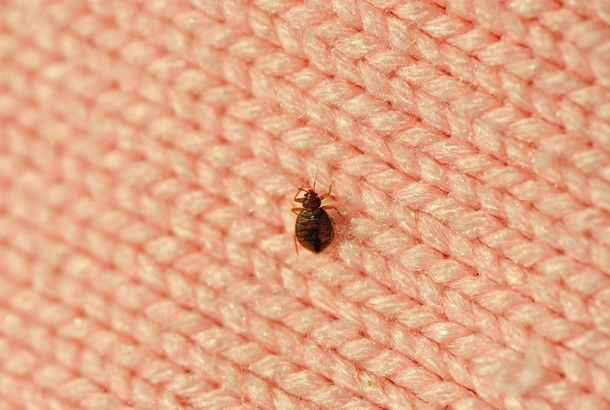 Latest Victim of Bedbug Bloodsucking: New York City’s Tourism IndustryOh, wait, you thought we were serious about the summer of bedbugs? See Greg Gutfield Devoured by a Giant BedbugA 100 percent accurate video from Taiwanese news-animators NMA. Brad Goreski May Have Split With Rachel Zoe Much Earlier Than Announced; Anna Dello Russo’s Hat Blocked the Sartorialist’s View of Kanye West’s RunawayAlso, Kate Spade is publishing a collection of short stories. Bedbugs Are the New STDsLandlords are legally required to fill out a new disclosure form for bedbugs. Shootout at Kraft Foods Facility Leaves Two Dead and One Injured; AmericansPlus Food Network Magazine’s offices might have a bedbug problem, and Bizarre Foods with Andrew Zimmern inspires a new board game, all in our morning news roundup. Six Cities Worse Than New York in Terms of Bedbugs, Most Other ThingsSucks to be you, major cities in Ohio.